•Moved aged 3 to Aix en Provence. Childhood friend of Cezanne. •In 1847 family falls on hard times after father’s death. By 1858 Zola is back in Paris with a job as a clerk. •First best seller: L’Assoimoir, 1877. •Biggest public controversy: J’Accuse, Zola intervenes in Dreyfus affair. •Died 1902 of carbon monoxide poisoning when his chimney became blocked. •Published in 1886. Initially instalments in Le Gil Blas starting December 1885. •Concerns the artist “Claude Lantier” his personal and career struggles. •Part of the Rougon-Macquart series of novels. Originally planned as a series of 10 novels with the art-world novel as number 9, this was in fact number 14 of (eventually) 20. •Zola was keen on the term “Naturalism” as a description of his own project. •As an art critic he had used the word from 1868 onwards to describe the Impressionists’ work. Previously he had labelled them “Realist”. •Russian readers were treated to a critique of the Second Impressionist show 1876 in which Zola found fault with both Caillebotte and Degas. He praises Morisot, Monet, Pissarro, Renoir and Sisley. •Age 20 went to law school but kept up drawing lessons. •Abandoned legal studies to become an artist. An act of rebellion which his father would later support. •Work in 1863 Salon des Refuses. Then rejected annually 1864-69. 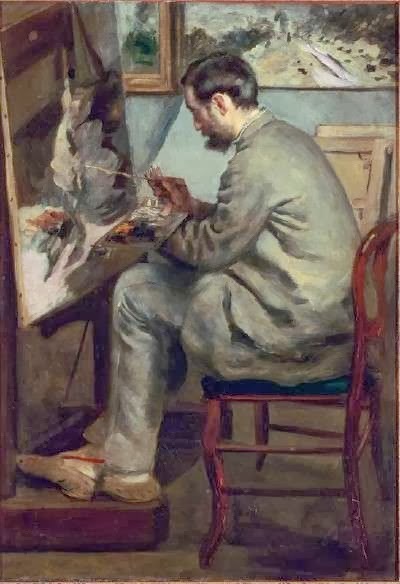 •Antoine Guillemet finally secured one successful Salon submission for Cezanne: 1882 showing of his 1866 portrait of his father. •1874 and 77 he showed with the Impressionists. •Death of father in 1886 means Cezanne has his own fortune. •Rarely showed work between then and 1895 when the art dealer Vollard began to support him.